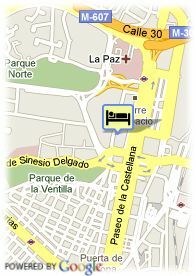 Castellana 259 B, 28046 Madrid, Spanje. 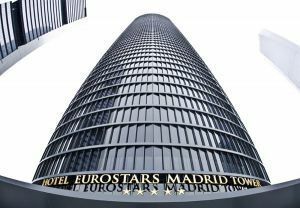 Hotel Eurostars Madrid Tower is a cosmopolitan establishment located in one of the most dynamic areas of major economic development in Madrid and it is built on the site of the former Real Madrid sports club. It offers 38 floors and 230 metres in height, this amazing establishment is housed in the SYV Tower, designed by Enrique Enrique Álvarez-Sala Walter and Carlos Rubio Carvajal. All the guestrooms of the hotel are decorated in modern and elegant style and they are full of natural light and have spectacular panoramic views over the city of Madrid. Its exterior glass casing houses a comfortable, luxurious hotel comprising almost 500 grand luxe guestrooms, Conference rooms, restaurants, a relaxing thermal centre and exclusive VIP area complete one of the most impressive hotels in Europe.